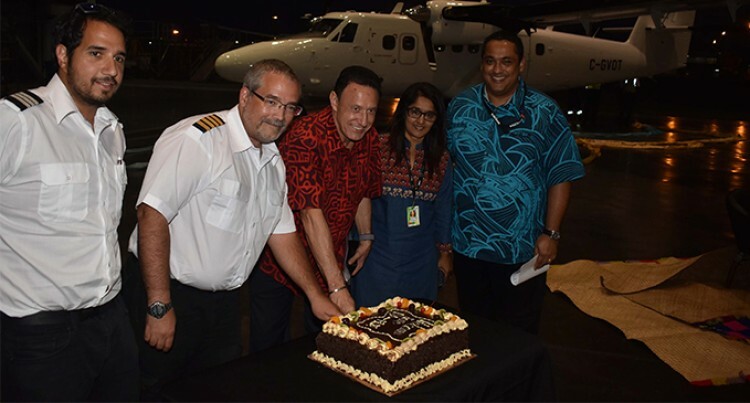 Fiji Link welcomed the delivery of their fourth Viking 400 Twin Otter last night. Fiji Airways managing director and chief executive officer Andre Viljoen confirmed that their engineering team will begin painting the aircraft and installing the seats and internal furnishing immediately. The aircraft is expected to enter commercial service on August 24. Mr Viljoen said: “This is all part of our complete fleet renewal that we have undertaken for Fiji Link and this was a journey that we started more than a year ago. He added this is part of Fiji Airways overall boost to helps bring down the average age of the fleet. “It’s again a testament of how a small airline is punching above its weight. Recently at the Skytrax Awards, Fiji Airways received the award of the third best most improved airline in the world and that’s quiet an accolade. “This type of action of modernising our fleet that helped us achieve this great attribute. “We chose the Viking 400 because it suits the many of the destinations we fly to. It is a robust aircraft and has all the latest avionics and certainly will do the job we require from it. “It allows to land on shorter airstrips, grass runaways, and will give our passengers a lot more frequencies and especially to markets like Savusavu and Taveuni where in the past we struggled with our old Twin Otters.